Wayne Bolton, of One Land Love It (OLLI), is a 49 year old family man, and a respected entrepreneur from Port Elizabeth, South Africa, with an investment in and a passion for the natural heritage of Africa. His heart bears the title of his Expedition: One Land Love It. 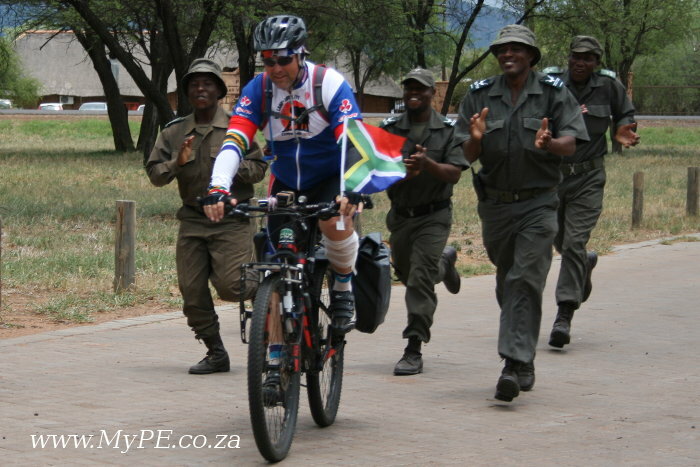 Mr Bolton is cycling 6000km across South Africa in 80 days to all 19 South African National Parks. This journey spans the heat of summer: 28 November 2015 to 13 February 2016. And on Sunday 3 January 2016 he reached the half way point of 3000km somewhere on the road between Pofadder and Springbok. The temperature has reached well above 50 degrees Celcius (122’F) at times and averages in the 40’s, making this ordinary adventurer go beyond where he thought he could and achieve more than the expected. For this African summer the heat is on! The Namib desert, in which this half way point was reached, is part of the fastest growing desert in the world. Mr Bolton has seen first-hand the devastating effects of the current drought that parts of South Africa are now experiencing. The harsh and unrelenting heat drives animals, ribs showing, to what shade they can find, with no water in sight. There is much evidence of those animals that have succumbed along the way. He has also had the pleasure of cycling along remote roads in wild and beautiful coutryside teeming with life and had the occasional race against warthogs and ostrich. This journey involves a personal connection with the environment and brings home the value of our natural heritage and the need to conserve it. Mr Bolton has experienced muscle and tendon strains, pressure sores, sunburn (even through clothes), heatstroke, headaches, raised temperature, dehydration and other challenges. He has soldiered on. And it is this dedication to the cause that has inspired other ordinary people to get involved. Along the route many establishments have heard of this adventurer and his support crew and have offered beds and food: vital to the success of the expedition. People passing on the road have stopped and spoken and donated and even cycled part of the way to show solidarity with the cause. And rangers at the South African National Parks (SANParks) have been inspired and astounded in equal portion. They have been quick to offer reciprocal support and encouragement. On one of his stops to replenish his water supply, Mr Bolton registered an eyebrow raising 59’C (138F). SANParks Rangers at the Kgalagadi Transfronteir Park who understand the impact of temperature, wind and topography are “amazed that he is taking on such a challenge under those conditions”, so Section Ranger Micho Ferreira and his rangers showered encouragement and appreciation for Mr Bolton’s efforts. Section Ranger Nardus du Plessis showed his support by joining a 20km cycle with Mr Bolton on his pre-dawn exit from Augrabies Falls National Park. The South African National Parks Rangers have more chance of engaging poachers in armed combat than does the National Defence Force. This shocking piece of information puts into perspective just how serious the poaching “issue” is in Africa. If ordinary people, like Wayne and his family, don’t participate in this war then the very real prospect of extinction faces large species such as rhino, elephant and lion. Therefore the first beneficiary is these noble rangers who are on the front line. Incidents involving orphaned baby rhino’s have escalated as poaching has escalated. It takes special dedication of up to 18 months to rehabilitate just one of these magnificent, and threatened, creatures. Care for Wild Africa is one such centre that works hand in hand with the South African National Parks veterinarians, rangers and zoologists to ensure that these babies are “counselled”, fed, trained and rehabilitated for reintroduction into the wild. Currently the Scroll of Unity in Conservation, a pledge signed by SANParks representatives has been proudly signed by 7 of the 19 National Parks: Kruger, Mapungubwe, Marakele, Golden Gate Highlands, Mokale, Kgalagadi, and Augrabies. Mr Bolton is currently on the road to |Ai-|Ais Richtersveld National Park and will continue to link all of the Parks and the staff who carry the responsibility of maintaining the integrity of our natural heritage. An appeal for individuals and companies to help with fuel costs has come through. Fuel prices, while dropping in January, are still high in South Africa and the Boltons are currently funding this aspect of the Expedition from their own pockets. Their passion for the message of One Land Love It is so strong that they have left their small business to run by itself for the duration of the expedition. Find out how to donate to the beneficiaries or expedition costs can be done here: www.oneland.co.za/donate. A Final Message from Wayne Bolton; “We are all ordinary people. The silence or lack of action from “good people” has led to a qualified 1071 rhino poaching incidents in 2015 according to www.stoprhinopoaching.com. Ordinary people can and should make a positive contribution to conserving our natural heritage. It starts at home. This expedition is an exercise in #JointCustody. The success of our journey would not be possible without the support of my family, our sponsors who make the expedition possible, and ordinary people in ordinary companies making the conservation of our natural heritage possible. Thank you to each and every one of you.” For more information visit www.oneland.co.za or contact at nikki@oneland.co.za.